If someone said to me – “You have thirty seconds to tell me your favourite childhood book. 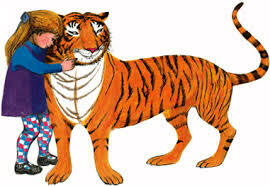 Go…..” I would choose ‘The Tiger who came to tea,’ by Judith Kerr. I still have my treasured copy – it’s a bit battered around the edges, but still in perfect reading order. My dad would read it to me when he got home from work, before he tucked me into bed. Some stories just stay with you and for me, this is definitely one of them. I always thought of myself as Sophie and used to idly picture a tiger calling in for afternoon tea. We always had cats & a large ginger tom called Sam played the part of the tiger – not very well though. The illustrations in the book are beautiful and ‘The Tiger who came to tea,’ has really stood the test of time. I read the book to both of my children and it took me back to a happy time and place. Thank you Judith Kerr, for some wonderful memories. ← Excerpt from The Art Class – A short story available free on Smashwords.